Ever wondered if the Plums you are receiving from California are the proper size? The USDA Grades do not require that plums meet a certain minimum size, or diameter. If the plums are packaged in one or two layer container, you should make sure the fruit are the proper size for the pack, meaning they are not loose in their molds, and are at least fairly tight. Simply counting the fruit in the pack to make sure it matches the count on the carton, and making sure the fruit is not moving around is about all you can do to determine the proper size. But if the plums are jumble packed, or volume filled, the count, or size marked on the carton has a different meaning. If the plums are marked as 55, in a volume filled container, you will find many more than 55 plums in the 28 pound container. The California Tree Fruit Industry has established their own sizing standards. For plums, the number of fruit on the container represents the maximum number of plums in a ten pound sample. So, for our example, a volume filled container marked as 55, you would weigh out 10 pounds of plums from the container. You would then count the plums in the 10 pound sample, and you are not allowed more than 55 plums. More than 55 plums means the plums are smaller than what is allowed, meaning it takes more plums of that size to equal ten pounds. One thing to remember, the 10 pound sample for count is to be used at the packing houses. Due to the natural shrinkage of the fruit, or weight loss at destination, the sample size to be counted is 9-3/4 pounds. 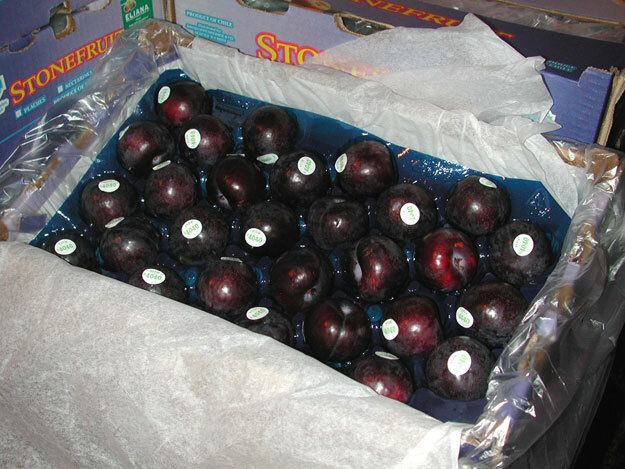 In other words, at your warehouse you would choose 9-3/4 pounds of plums randomly from a carton, count the number of fruit, and if the number of fruit is equal to or less than the number on the container, then the plums are properly marked as to size.